The kids and I spent much of yesterday waiting for and watching a parade. My kids love parades, and I, well, I tolerate them as a part of their childhood experience. To be honest there is a child inside that finds them a little exciting, but the grown-up parts of my brain finds them to be hot, if not scorching, and a bit uncomfortable. Maybe it is just that I don't walk away with a bag of candy at the end. Maybe that would sweeten the deal for me! Whatever my reasoning, I know that my kids love them and so, in our family, July is parade month. Between the Fourth of July and several local town celebrations throughout the month we will spend several days carrying chairs, umbrellas, and water bottles from the car to the parade route and sitting for ages to ensure a good view...all in triple digit temperatures! Ah, the things we do for our kids and tradition right? As I sat along the parade route yesterday lathering my pale little blondies with sunscreen for the umpteenth time I was thinking about ways we could beat the heat. When I pulled out sandwiches for the kids to eat and two of them flat out refused to eat (undoubtedly because they were too warm to think food even sounded good) I decided that I needed to research what foods could help us be better prepared and enjoy those hot days more easily. Whether it's parades, hikes, days at the beach or lake, or just those sweltering Saturday afternoon soccer games a lot of us will be spending a lot of time in the sun this summer so I wanted to share some of the interesting facts I learned so we can all do our best to beat the summer heat this year. The beverages you choose can make a huge difference as far as hydration goes and if you are well-hydrated you will be able to tolerate the warm temps much better. Remember that soda pop and even sports drinks are packed with sugar and sodium and while they may feel refreshing when you are guzzling them, they actually aren't helping in the long-run and they may just leave you even more thirsty. Sticking with water will give your body what it needs to stay cool and healthy...and if you really can't beat the heat you can always dump it on yourself like my kids do. I don't recommend that tactic with soda pop! The crisper drawer in your fridge holds all sorts of awesome ingredients that will help your body be prepared for the heat. There are several fruits and vegetables with high water content and packed with lots of nutrients and not only taste and feel refreshing when eaten, but help your body maintain that nice cool balance. Fruits like berries, grapes, apples, pears, peaches, and dragon and star fruits are all great options, but these allstars will give you the biggest bang. 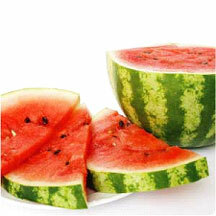 Watermelon: Watermelon is packed with water. As much of 90% of that delicious wedge is water so there is no wonder why it is a summer classic. Add in the high volume of vitamins A and C, consider that it has no fat and that it contains an antioxidant called lycopene, which is believed to aid in the prevention of cardiovascular disease and cancer, and you have several good reasons to keep that melon ready to go this summer. All that and the undeniable excitement kids get from being able to spit out seeds and I think it is win-win for everyone! 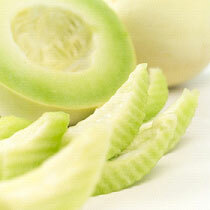 Cantaloupe and Honeydew Melon: Both have high water content but are also low in calories and high in potassium. They aren't particularly rich in many other nutrients, but their low protein, fat, and carb content make them a good choice for those battling weight loss, cardiovascular disorders, hypertension, and diabetes. 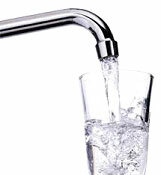 They may also help rid your body of unwanted toxins as they are considered to be a diuretic. Citrus: Oranges, lemons, limes, and grapefruit aren't just delicious, they are also among the most cooling of all fruits. Citrus fruits are packed full of vitamin C and several nutrients and antioxidants that provide benefits from helping with the breakdown of rich and fatty foods in the system to helping make the skin healthier. Refreshing, healthy, and it will make me look better? I'll take two please! 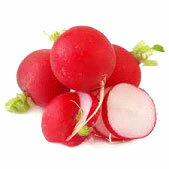 Radishes: Radishes are sadly underrated, and even moaned and groaned about at my house, but they certainly deserve more credit than they get! There is a lot of water, vitamin C, antioxidants, and even anti-inflammatory properties packed into that little crispy little veggie! All that's great, but the best thing I learned about these little beauties is that they are a rich source of potassium, which can help lower the risk of kidney stones and stroke. Having had kidney stones twice, I would eat about anything that could keep that from happening again! Cucumber: The very flavor of this vegetable is cooling and refreshing and that is just one reason for the old "cool as a cucumber" addage. High water content and low sugar, carbohydrate, and fat content make cucumbers a perfect summer choice. Cucumbers also have diuretic properties (to flush those toxins) and significant amounts of vitamin B, phosphorus, calcium, zinc as well as other minerals which all help to make this one incredible super vegetable! 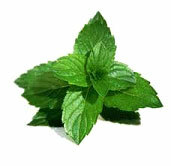 Mint: My mom used to make wonderful lemonade and then send us kids out to the garden to pick some fresh mint to toss in. As a child I never really understood why she wanted leaves in there, but it seemed to me at the time that my mom had done stranger things, so I don't think I ever bothered to ask. Truth is, both mint and peppermint have amazing cooling and relaxing properties. Their aroma is downright heavenly and mint is known to help relieve indigestion and inflammation, which can both be problems in the hot summer months. Whatever your summer event menu calls for, make sure that you and your guests are staying well hydrated! Heat can make or break a good celebration and nobody wants to leave the parade or party sick and sunburned! Enjoy the rest of the summer and, as thousands of yearbooks have put it, stay cool!